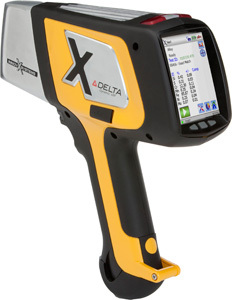 DELTA Scrap Sorting Handheld XRF Analyzers provide reliable ID in 1-2 seconds for most alloy grades and pure metals. They are designed for durability - to withstand the toughest processing environments. Get fast, reliable alloy sorting and analysis for a wide variety of ferrous and non-ferrous materials in seconds. At the conclusion of a test, a new window opens on the display with the assigned message. 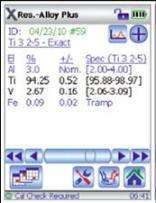 For example, a "316" ID can tell the operator: "Mo content: mark BLUE"
Analysis results display demonstrating Nominal value (3%Al) and Tramp element (0.09% Fe) features. 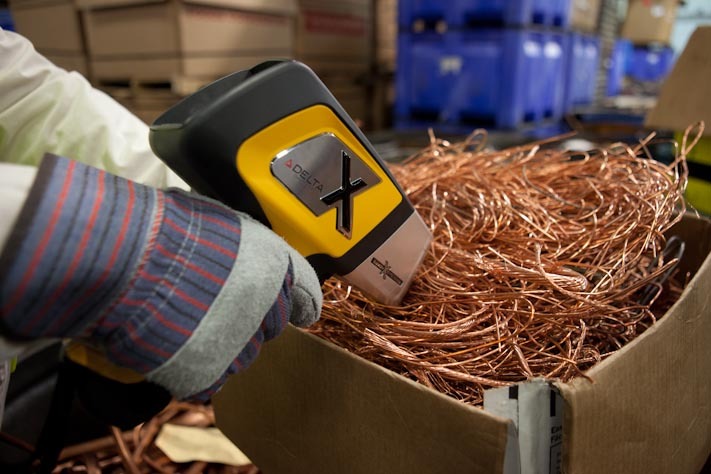 Combining a SiPIN detector with a 4W optimized tantalum (Ta) or gold (Au) X-ray tube, our DELTA Classic Plus is a high tech, flexible analyzer for typical XRF analysis for measuring titanium (Ti) through Sb. 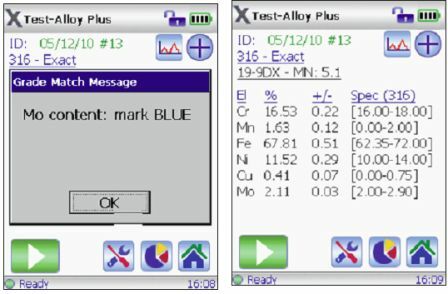 The DELTA Classic Plus model for Alloys & Metals Analysis is referred to as DC-2000. 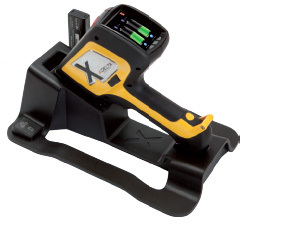 DELTA XRF analyzers are versatile, precise tools that can be utilized for a variety of sorting and analysis applications - real-time, with little training and little to no specific calibrations necessary. DELTA analyzers can be upgraded as needed - as your business changes, DELTA analyzer can be adapted to fit your analytical needs. Whether your needs are basic ID and sorting, or more extensive tramp element analysis, Olympus Innov-X has the analyzer to fit your business demands. 356 - measure 0.4% Mg in only 10 seconds! 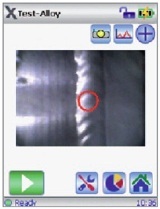 Verify residual content in steels. 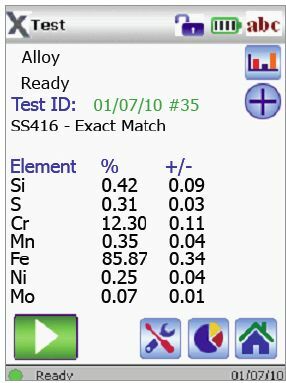 Confirm Si, S and P content, along with Mn and alloying element levels. Sort based on chemistry requirements. 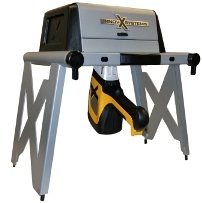 A battery powered angle grinder is all the help you need. Just clean the surface and analyze. Within seconds you'll have the sorting information needed to classify, sort and price out a load of material. Within seconds, separate brasses, bronzes, leaded, and aluminum & silicon containing alloys. As with all grades, sample geometry isn't important - the DELTA will automatically compensate for sample shape and size. 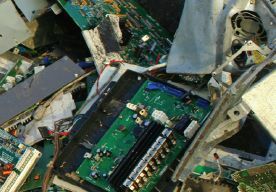 Even sort out Be Copper using the DELTA's nominal chemistry feature and reliable analysis accuracy. 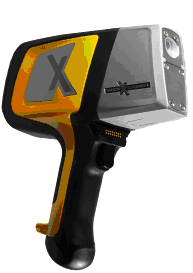 XRF is a nondestructive and non-intrusive technique. Within seconds, the DELTA will provide not only chemistry analysis, but also instant karat determination. 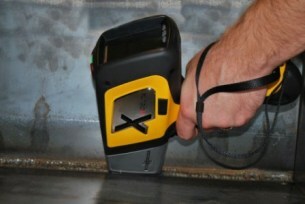 Gold, silver, platinum alloys and more can be tested confidently. 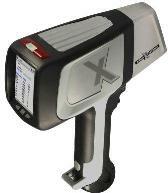 The DELTA is also available with integrated camera and small spot collimation for detailed analysis of small components.